During the recent tour "From Stromboli to Etna" we observed mild to moderate explosions from Stromboli volcano. The most active vent appears to be in the former central crater, with powerful explosions throwing glowing material up to 200m elevation above the crater and often outside on the N and NE flanks. Other vents in the eastern and western part of the crater erupt occasionally with loud bangs and loud hissing noises produced by strong gas jets. Stromboli volcano (Italy): access to summit area reopened! As our colleague Andrea Ercolani reports from Stromboli, access to the summit area of Stromboli has been reopened for guided tours under certain restrictions. In brief, small groups accompanied with authorized guides can now reach the ridge east of the crater terrace between 750 and around 850 m elevation where a few shelters are located, but the maximum stay is now limited to 30 minutes. Access to the Pizzo summit itself is limited to the time necessary for passing along the trail. After the effusive eruption which ended on 4th of April this year and a powerful vent-clearing explosion on 15 March, there have been deep-seated explosions ejecting black ash clouds since May. In July, these have beomce more regular and it seems that the magma level inside the vents has been rising and there could soon be visible lava ejections again. The lava continues to flow on Stromboli. Three branches of lava flows originate at the 420 m vent on the Sciara del Fuoco, two of which still reach the sea. On 20 March, lava emission from the 400 m vent on the Sciara del Fuoco increased, accompanied by increasing levels of tremor. Two well-alimented lava flow branches were present on the Sciara. On 15 March at 21.37 local time, a powerful explosion occurred from the summit craters of Stromboli, similar but much weaker than the event on 5 April 2003. Incandescent bombs were thrown onto the flanks of the volcano and created small bushfires. Ash fell on the inhabitated centers of the island, but nobody was killed or injured during the eruption. The monitoring network registered a slightly increased flux of lava from the 400 m vent immediately prior to the explosion. As a security measure, access to the volcano has been reduced frm 400 m to 290 m elevation. The lava flow from the 400 m vent at the eastern sector of the Sciara del Fuoco is still active. Already this morning, the new effusive vent at about 500 m on the Sciara del Fuoco was almost inactive and little remained of the lava flow that started yesterday. The other lava flow from the 400 m vent continues to be active although the flux of lava seems to be diminuishing. Its front has overlapped the impressive lava delta and continues its groth. On 8 March, the lava flow from the 400 m vent below the 2003 lava plateau suddenly ceased almost completely. In the evening, the two branches of the flow and the lava delta at the sea were cooling, only a few red spots were visible from fractures on the surface, and a few glowing blocks and small amounts of sea water steam were still visible at the former entry points. At the vent itself, only a very weakly alimented flow extending perhaps 10-20 m was visible. Probably in the morning of 9 March, the lava effusion from the 400 m vent increased again, feeding a new lava flow, which has been flowing on top of the older flow. At our arrival at the scene at around 3pm, the flow front, about 5 m high and 20 m wide, was at about 200 m elevation. By the time we left at around 7pm, it had reached the base of the lava delta, and we think it will reach the sea during the night. In the morning and early afternoon of today, frequent ash bursts were visible from the summit craters, probably related to deep seated typical strombolian activity. Some of the ash eruptions also ejected larger fragments as could be detected on photographs. These ash emissions stopped when a new fissure vent opened at the Sciara del Fuoco, at about 500 m elevation and several 100s meters NW of the other vent, more or less beneath the former NW crater. This new vent announced its birth by a spot on the Sciara where a small and then increasing amounts of steam and then bluish gas were emitted, from around 3:30 pm onwards. At around 4 pm, we could observe a new, thin and weakly alimentated lava flow issuing from this point. The opening of the vent was accompanied by intense rockfall activity and another phenomenon which is briefly described: After the first appearance of lava, we observed low but dense clouds of white steam and brownish dust travelling downwards along a more or less streight path from the new vent. These "travelling steam and dust clouds" looked similar to small avalanches, propagated typically 100-200 m downhill and lasted around 10-20 seconds. This phenomenon reapeated several times during the following hour, and the clouds started at different points, and tendentially always more downhill where they finally came very close to the sea. Although we are not able to tell whether these were small dust flows created by sliding loose material or rather a new fracture opening and propagating on the surface, we believe the latter interpretation to be right. At around 5 pm, the lava flow had become about 200 m long and seemd to aquain speed. At this point, rockfalls of older material and from the new lava flow front triggered small, classic pyroclastic flows that reached the beach and were different from the propagating clouds described before. 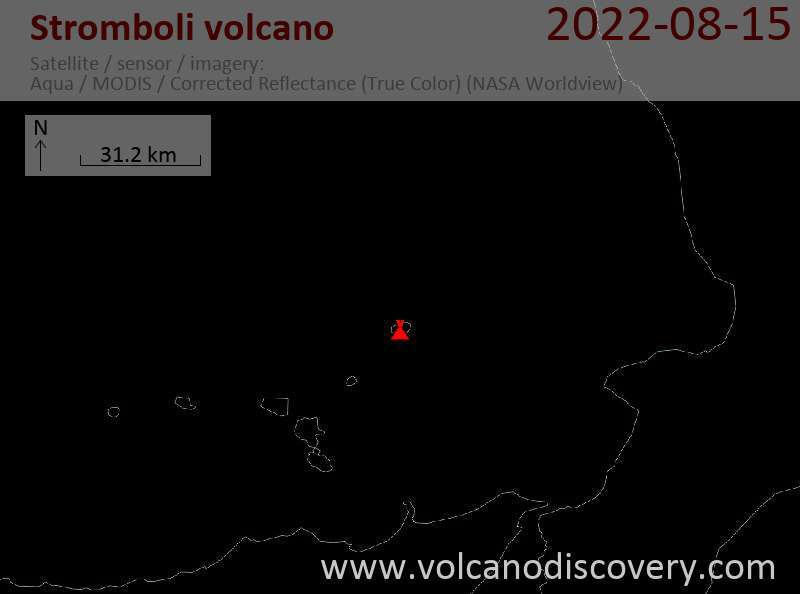 From 6 pm onnwards, deteriorating weather and nightfall prevented further detailed observations, but the new flow in the NW sector of the Sciara had already reached an elevation of about 300 m.
The lava flow is still very active at Stromboli volcano. As observed from location, the summit craters and the adjacent areas to the NE have undergone significant collapse. The NE crater is now breached by a V-shaped incision and the flat area of the 2003 lava flows has sunk by around 20-50m as measured by radar (INGV). From the originally two vents of the current eruption, located along a fissure that cuts the craters, the pianorolo (the flat area east below the summit craters, where the vents of the 2003 effusive eruption were located) and part of the Sciara del Fuoco, only the lower one at about 400 m a.s.l. is still active. It feeds a well-channeled lava flow that branches into two arms that reach the sea at the eastern end of the Sciara del Fuoco. At the sea, the new lava has formed a large delta, about 200 m wide and streching 50-100m into the sea from the old shoreline. A vigorous steam plume is originating from the entry points which are well visible from various viewpoints along the lower rims of the Sciara del Fuoco. Occasionally, phreatic explosions were visible at the entry point on 4 March. Large numbers of rockfalls, mostly some 100s meters W of the lava flows are occurring on the Sciara del Fuoco. Access to the area is restricted by the Protezione Civile (Civil Defense unit); the area is still open for visitors to a maximum of 400 m, but it is planned to restrict access to the area of the Punta Labronzo at around 100 m a.s.l., above which further access will only be allowed with authorized mountain guides. Lava continues to flow from two vents high on the Sciara del Fuoco at Stromboli. The lava flows for 3 branches that have reached the sea where they generate thick white steam plumes. Access to the area is limited to a viewpoint at 273m a.s.l. A team of VolcanoDiscovery is on their way to report more details from the island. Stromboli volcano erupted today with a new lava flow. (27 Feb. 2006), as we had forecasted in July. After a strong increase in its typical strombolian activity (which had been on very high levels throught the past 36 months), two effusive fissures appeared in the upper region of the Sciara del Fuoco beneath the summit craters. The new vents feed two lava flow, one of which ahas already reached the sea. This marks the first effusive eruption with lava flowing outside the craters at Stromboli since the last effusive eruption from Dec. 2002 to July 2003. INGV and local newspapers report that scientific staff is on their way to montior the situation. At present the eruption poses no danger to people or property on the island. As a precaution in case of an emergency evacuation, two ferries have been ordered standby near the island.